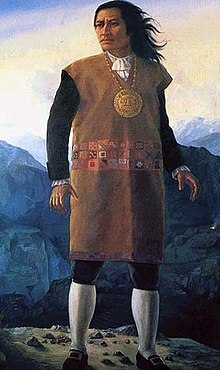 A kuraka (Quechua for the principal governor of a province or a communal authority in the Tawantinsuyu) or curaca (hispanicized spelling) was an official of the Inca Empire who held the role of magistrate, about 4 levels down from the Sapa Inca, the head of the Empire. The kurakas were the heads of the ayllus (clan-like family units). They served as tax collector, and held religious authority, in that they mediated between the supernatural sphere and the mortal realm. They were responsible for making sure the spirit world blessed the mortal one with prosperity, and were held accountable should disaster strike, such as a drought. Kurakas enjoyed privileges such as being exempt from taxation, the right to polygamy and to ride in a litter. The kuraka was an aristocrat who frequently, but not always, descended from the previous generation. Kuraka means 'superior' or 'principal', and his authority was granted by the Inca. Each ayllu actually had four kurakas: upper and lower (hanan and hurin), and each of these had an assistant. However, of the four, one kuraka was still superior to the rest. With the conquest of Peru by the Spanish, the Spanish system of rule utilized indigenous leaders as mediators to mobilize labor and tribute from their communities for delivery to Spaniards awarded those benefits in encomienda. The system was implemented first in the Caribbean islands, where such leaders were called caciques, then Mexico, where the Arawak term cacique was extended, and then in the Andean region, where the term kuraka persisted. Indigenous elites maintained their positions so long as they played their assigned role. In the late eighteenth century, the increased taxation of indigenous put pressure on kurakas' allegiances to their own communities and their desire to maintain their status in the colonial order. The 1781 Tupac Amaru rebellion, led by a kuraka, José Gabriel Condorcanqui, known as Tupac Amaru II, was the most serious challenge to the Spanish colonial order in the Andes since the Spanish conquest. One of the functions of the kurakas was to choose a bride for adult males, aged 25 and over, who could not choose, or had not chosen, a wife. The kurakas could also decide, in the event two men wanted to marry the same woman, which man would be allowed to marry. The kurakas also dealt with minor crimes, but had to refer major crimes to the provincial capital. Among other duties, the kurakas settled disputes, allocated agricultural lands, organized community events, and officiated ceremonies. Túpac Amaru II, kuraka who led the great Andean rebellion in 1781. Modern image. The kurakas experienced a transformation during the first years of Spanish conquest of the Inca Empire. Since the Inca had not consolidated their rule over many regions, some kurakas were anti-Inca and pro-Spanish. Outside of the former Inca capital of Cuzco, "the regional caciques [kurakas] were the most resolute collaborators with the Spanish Crown." In Peru and elsewhere in Spanish America, the Spanish crown recognized indigenous nobility, so long as they were loyal to the Spanish monarchy. They were exempt from taxation and were granted privileges to ride horses and carry swords. This did not entail a renunciation of their traditional sources of power and prestige. In practical terms, the kurakas collected tribute and mobilized labor, essential to the functioning of the economy under Spanish rule. Some kurakas in the colonial era attempted to strengthen their claims to power and intermarried with the royal Inca descent groups, while at the same time pledging loyalty to the Spanish crown. This situation resulted in their needing to reconcile these two loyalties in the colonial situation. The role of the kuraka was further transformed in the late colonial era. In the late eighteenth century during the Bourbon reforms, administrative reorganization by the Spanish crown, taxes were increased and greater pressure was put on kurakas as mediators, a key element in the massive, coordinated Andean uprising in 1780-1 known as the Tupac Amaru rebellion. In the period after the Great Rebellion, the crown no longer recognized the kurakas, delegitimizing their lineages and extinguishing them. The traditional elite attire of indigenous nobles was banned, as was music, dance, painting of images of Incas, Inca names, and other cultural manifestations of Inca power and influence. The crown rewarded loyalist kurakas with material rewards, such as money and land, as well as markers of prestige, such as military promotions and titles. However, the power and position of kurakas in general was eroded. At independence in 1825, independence leader Simón Bolívar abolished titles of nobility. Abercrombie, Thomas A. "Tributes to Bad Conscience: Charity, Restitution, and Inheritance in Cacique and Encomendero Testaments of Sixteenth-Century Charcas" in Dead Giveaways: Indigenous Testaments of Colonial Mesoamerica and the Andes, Susan Kellogg and Matthew Restall, eds. Salt Lake City: University of Utah Press 1998,pp. 249-289. Cahill, David. Violencia, represión y rebelión en el sur andino: la sublevación de Túpac Amaru y sus consecuencias. Documento de Trabajo, no 105. Serie Historia, Lima: IEP 1999. Méndez, Cecilia. The Plebeian Republic: The Huanta Rebellion and the Making of the Peruvian state, 1820-1850. Durham: Duke University Press 2005. Ramírez, Susan E., "The 'Dueños de Indios': Thoughts on the Consequences of the Shifting Bases of Power of the 'Curaca de los Viejos' Under the Spanish in Sixteenth-Century Peru," Hispanic American Historical Review 67, no. 4 (1987):575-610. Ramirez, Susan E., "Rich Man, Poor Man, Beggar Man, or Chief: Material Wealth as a Basis for Power in Sixteenth-Century Peru." In Dead Giveaways: Indigenous Testaments of Colonial Mesoamerica and the Andes, Eds. Susan Kellogg and Matthew Restall. Salt Lake City: University of Utah Press 1998, pp. 215-248. Saignes, Thierry. Caciques, tribute, and migration in the southern Andes: Indian society and the seventeenth-century colonial order. Trans. Paul Garner. London: University of London 1985. Serulnikov, Sergio. “Disputed Images of Colonialism: Spanish Rule and Indian Subversion in Northern Potosí, 1777-1780.” The Hispanic American Historical Review, vol. 76, no. 2, 1996, pp. 189–226., www.jstor.org/stable/2517139. Spalding, Karen. “Kurakas and Commerce: A Chapter in the Evolution of Andean Society.” The Hispanic American Historical Review, vol. 53, no. 4, 1973, pp. 581–599., www.jstor.org/stable/2511901. Spalding, Karen. “Social Climbers: Changing Patterns of Mobility among the Indians of Colonial Peru.” The Hispanic American Historical Review, vol. 50, no. 4, 1970, pp. 645–664., www.jstor.org/stable/2512307. Stern, Steve J. “The Rise and Fall of Indian-White Alliances: A Regional View of ‘Conquest’ History.” The Hispanic American Historical Review, vol. 61, no. 3, 1981, pp. 461–491., www.jstor.org/stable/2513394. ^ a b Incas: lords of gold and glory. New York: Time-Life Books. 1992. p. 61. ISBN 0-8094-9870-7. ^ Ramírez, Susan E. (2005). To feed and be fed: the cosmological bases of authority and identity in the Andes. Stanford, Calif: Stanford University Press. p. 135. ISBN 0-8047-4922-1. ^ Jean-Jacques Decoster; Pedro Sarmiento de Gamboa; Sarmiento de Gamboa, Pedro; Vania Smith; Bauer, Brian S. (2007). The history of the Incas. Austin: University of Texas Press. pp. 146, 147. ISBN 0-292-71485-8. ^ McEwan, Gordon Francis. The Incas: New Perspectives. W. W. Norton. pp. 96–98. ISBN 0-393-33301-9. ^ Incas: lords of gold and glory. New York: Time-Life Books. 1992. p. 132. ISBN 0-8094-9870-7. ^ Incas: lords of gold and glory. New York: Time-Life Books. 1992. p. 138. ISBN 0-8094-9870-7. ^ Earle, Timothy K.; Johnson, Allen W. (1987). The evolution of human societies: from foraging group to agrarian state. Stanford, Calif: Stanford University Press. p. 263. ISBN 0-8047-1339-1. ^ Cecilia Méndez, The Plebeian Republic: The Huanta Rebellion and the Making of the Peruvian State. Durham: Duke University Press 2005, p. 102. ^ Teresa Gisbert, Iconografía y mitos indígenas en el arte. La Paz: Gisbert y Cía 1980, p. 117. ^ Méndez, Plebeian Republic, p. 102. ^ Méndez, Plebeian Republic, p. 103, David Cahill, "Conclusion" in Peter Bradley and David Cahill, Habsburg Peru: Images, Imagination, and Memory. Liverpool: Liverpool University Press 2000, p. 140. ^ Méndez, Plebeian Republic, pp. 102-5. This page was last edited on 14 May 2018, at 20:02 (UTC).